Official description: By definition, an India pale ale is hoppier and higher in alcohol than its little brother, pale ale—and we deliver in spades. One of the most well-respected and best-selling IPAs in the country, this golden beauty explodes with tropical, citrusy, piney hop flavors and aromas, all perfectly balanced by a subtle malt character. This crisp, extra hoppy brew is hugely refreshing on a hot day, but will always deliver no matter when you choose to drink it. Hops: Magnum, Chinook, Centennial, Azacca, Calypso, Motueka, Ella & Vic Secret. 6.9% ABV, 71 IBUs. Stone’s core lineup had a major overhaul from 2015 to 2017 that dumped several year-round brands like Stone Pale Ale (and even its successor Stone Pale Ale 2.0), Ruination Double IPA, Cali-Belgique IPA, and Stone Smoked Porter. New to the lineup are Tangerine Express IPA (my personal favorite), Go-To IPA, Delicious IPA, Tropic of Thunder Lager, Ripper Pale Ale, Scorpion Bowl IPA, Fear Movie Lions Double IPA, and Ruination 2.0 Double IPA. It’s a lot of IPA. Essentially the only beer to not get axed was the original Stone IPA, which the brewery has made since 1997. I, among others, speculated that Stone would come out with a Stone IPA 2.0 in the same vein as Stone Pale Ale 2.0 and Ruination 2.0. The idea was that these recipes were outdated and needed to be modernized to keep up with trends in craft beer. But we saw intense backlash from San Diego neighbor Green Flash Brewing when they tossed out their original West Coast IPA recipe in favor of a new one. That change among several other missteps led the brewery to foreclose last year. The decision to keep the original Stone IPA recipe intact was a smart one, and I’m sure it continues to be their best-selling beer by far. 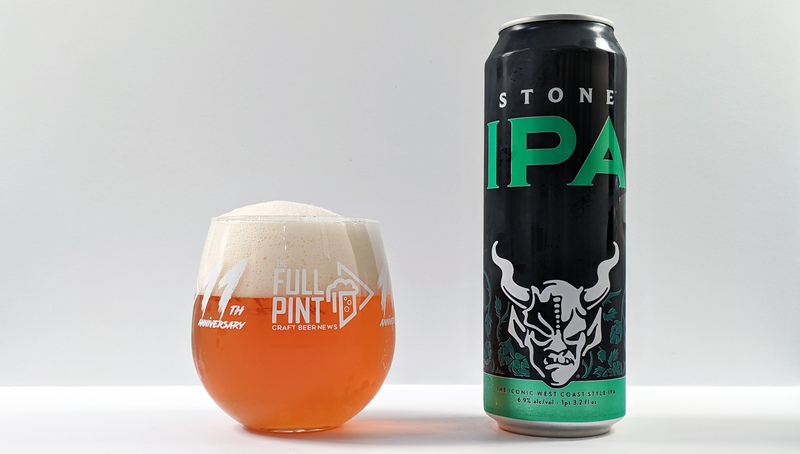 Though reading the website’s official description, the first thing that sticks out is that today’s Stone IPA is slightly different from the original recipe. The oldest recipe I could find from official sources has a hop bill of only Columbus, Chinook, and Centennial. Today’s includes a myriad of hop varieties from old classics to modern cultivars (see official description above). My unsubstantiated guess is that Stone uses whatever is needed to produce a consistent product as hop varieties can have fluctuating alpha and beta acid yields each harvest. 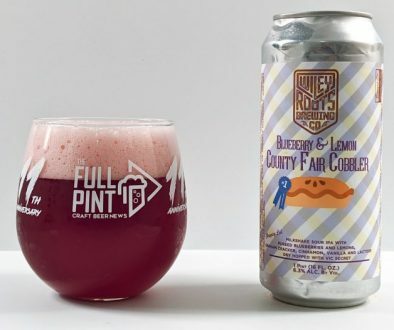 I’m sampling this from the newest format available for this beer, a colossal 19.2oz can, that seems to be found mostly in gas stations next to such gems as Bud Light Chelada and Four Loko. 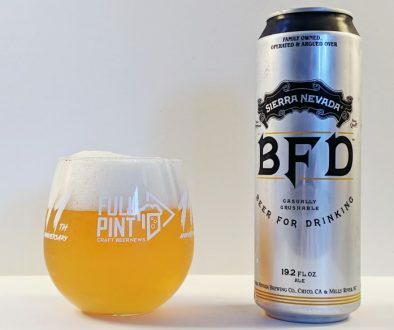 On the bottom of the can is a clearly printed packaging date of 2/13/19 and a best by date of 6/13/19 giving this a 4-month long freshness window – about standard for the industry. Into my glass, Stone IPA is crystal clear amber in color with buttermilk-colored foam that sports an oily sheen and rocky texture. Head retention is predictably excellent, lasting for several minutes before collapsing. Bringing up the glass, the initial aroma is certainly a step back in time. Orange slice gummy candies along with orange Twizzlers dominate the nose at first. Honey rolls and caramel poke through especially as it reaches room temperature. Digging in, Stone IPA is foremost an aggressively bitter beer with a big wallop of kettle hops from the get-go. Bitterness builds in the mid-palate where it peaks at a 9/10 intensity level and verges on abrasive. Flavors revolve around tannic tea leaves, Brazil nut, and burnt orange. Though bitterness is sky high, the beer is able to handle it with a medium to almost full-bodied malty base that is slightly toasty and dense with caramel. A drawn out, bitter aftertaste concludes each sip. It’s a relentless, intense beer at first, but it nicely mellows out as it warms or perhaps my palate is already shot. One thing is for certain, Stone IPA is not refreshing in any sense of the word. For many including myself, Stone IPA was our gateway into the world of craft beer. Along with Sierra Nevada Celebration, it was one of the first beers that really knocked my socks off with hop bitterness. Even though Stone IPA’s profile is definitively “outdated,” clearly this is what consumers want. Even with the “state of the art” being that breweries are shifting towards lighter-bodied, brightly-flavored, pale IPAs, Brut IPAs, and hazy IPAs; we cannot forget that the most popular IPAs continue to be these aggressively bitter, amber IPAs from the 1990s and early 2000s. Stone IPA, Bell’s Two Hearted Ale, Dogfish Head 60 Minute IPA, Lagunitas IPA, and others continue to dominate the overall scene. Even newcomers like Cigar City Jai Alai have found tremendous success emulating these classic recipes. There’s also the argument of familiarity. 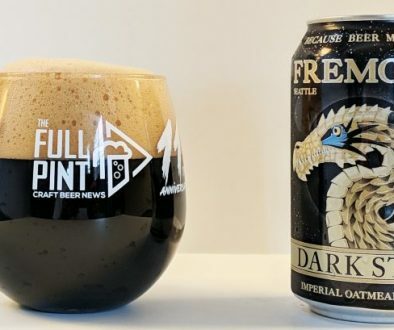 I’m sure many beer drinkers out there are overwhelmed by the constant flux of the craft beer industry and ever-changing kaleidoscope of brands on store shelves. It must be nice to pop in to just about any store that sells alcohol, grab one of these classic IPAs, and get your hop fix. Thank you! It seems like what is out on store shelves right now is still Stone IPA v1.1 as the video describes the new dry hop bill, which matches with what is on their website today. It just doesn’t separate out the kettle hops with the dry hops. If I understand correctly, Azacca, Calypso, Motueka, Ella, and Vic Secret are the new dry hops. Yeah, I guess I meant that the name has probably reverted back to Stone IPA, since I don’t see any more reference to 1.1 on the packaging. I’ll have to revisit this one. It’s been a while since I’ve had a regular Stone IPA.